1) Strange production. It's relatively dynamic at DR8, but the mix seems hollow and dull on my headphones, even with my speakers (which act as an amplifier for my headphones) set at the highest treble. Bass drums sound good, but the drumming itself isn't very inspired. 2) Melody has been on the forefront of songwriting. 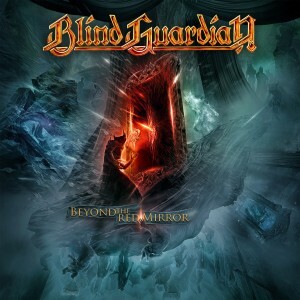 This album is relatively simple by Blind Guardian standards, closer to their earlier years. A lot of the choruses here are very catchy, but the same can't be said for the verses. 3) Hansi Kürsch sounds fantastic at 48 years old. He has been avoiding the high notes on live performances to protect his voice (although this must be disappointing to the fans), but he still uses them tastefully throughout the album. However, he opts for a more theatrical approach, and his visceral roars are sparse. Hell, I loved his backing vocals on Iced Earth's Plagues better. 4) The songs are far too slow. The drums plod tiredly and the guitars sounds like they are dying. This doesn't necessarily have to do with tempo, it could just be production, but the band seems to pack far too many unnecessary portions to each song, which could have benefited from tighter song structures. 5) Orchestra sounds too over the top. This is probably also why the album has been forced to be it bit more dynamically mastered, but at what cost? The guitars sound thin but the orchestra is in your face. As mentioned in first point, mix is very strange, but the orchestral music itself sounds out of place. Unsurprisingly, the songs that minimize orchestral arrangements are the songs that I have enjoyed here (Ashes Of Eternity and The Holy Grail). This songs are uptempo and sound more focused, without compromising melody. However, every other song could do with major trimming, especially when most of the verses are blatant filler to bloat the record.